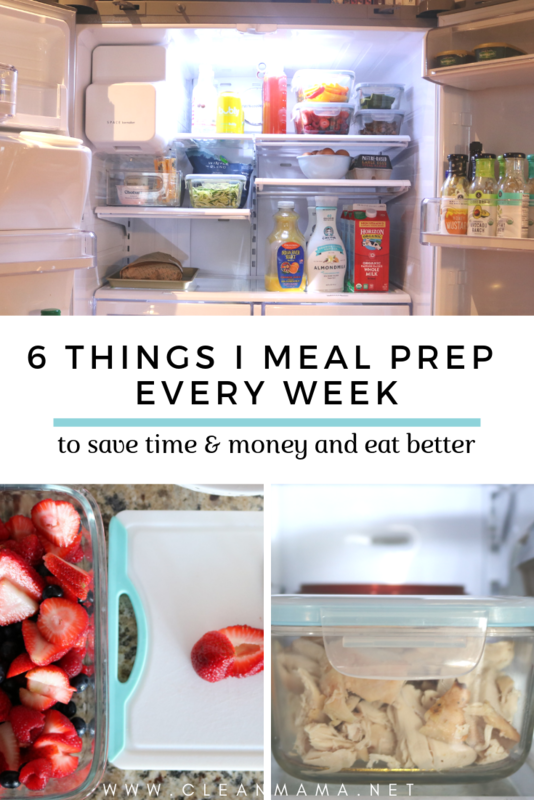 I’m a big fan of meal prep and menu planning and have talked about it quite a bit on the site – it’s how I stay sane through the week. 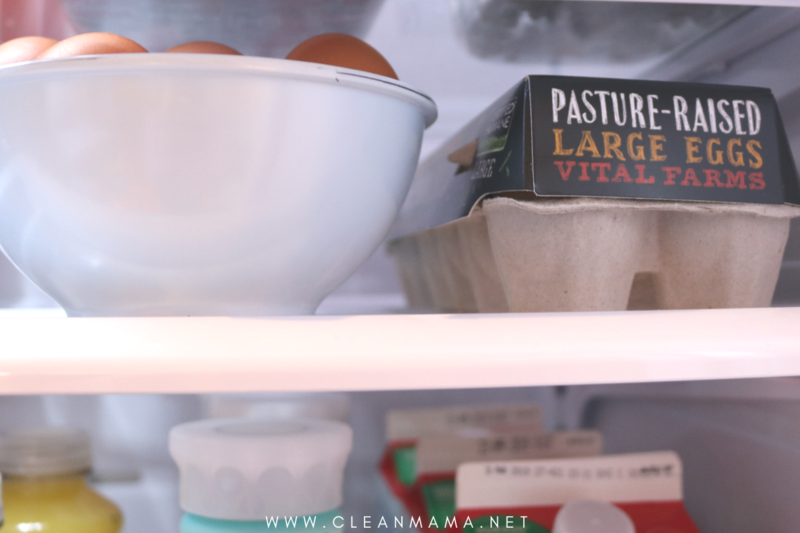 As I was meal prepping last week I thought about the things that I prep every week and that that might be helpful for you if you’re thinking about meal planning and prepping. The consistency is key to the success of meal prepping and honestly, I prep more components than anything else. Think of a couple things that you make often and figure out how you could add that into your weekly routine. Easily overwhelmed or not sure if you have time for this? Start with ONE thing that will free up time for you. Think about meal prepping as a gift to yourself over the week – it’s wonderful! 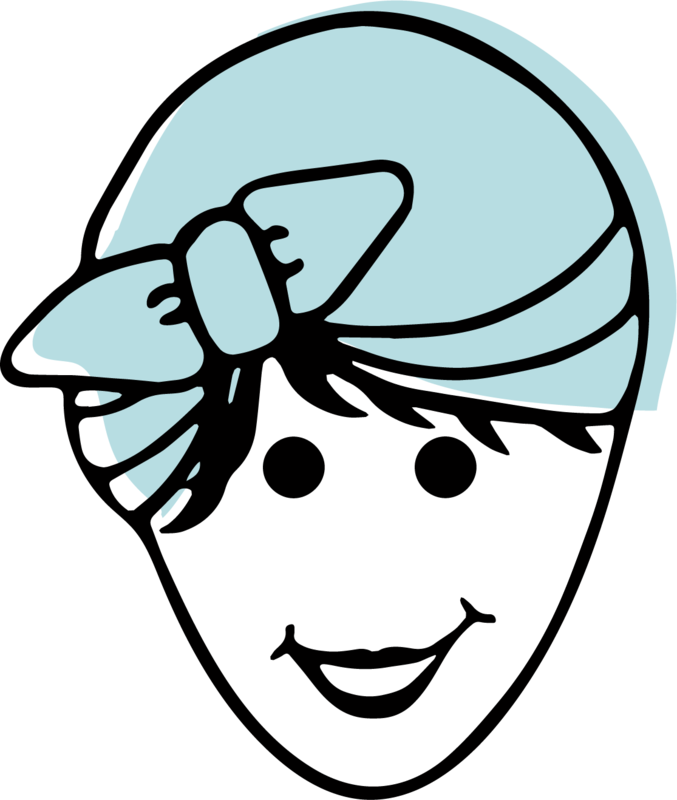 Curious about a product? I’ve linked them up at the bottom of the post for you. 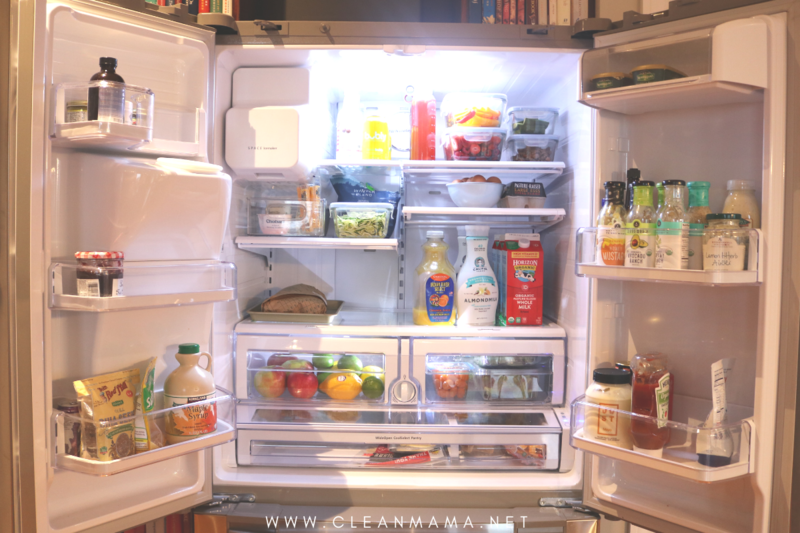 Head to this post for how I organize the refrigerator for meal prep and the week ahead. HARD-BOILED EGGS – I make a batch of hard-boiled eggs every week – I’ll typically do a dozen eggs. We use them for egg and avocado salad, a quick, high protein breakfast component, or we have them in a salad. 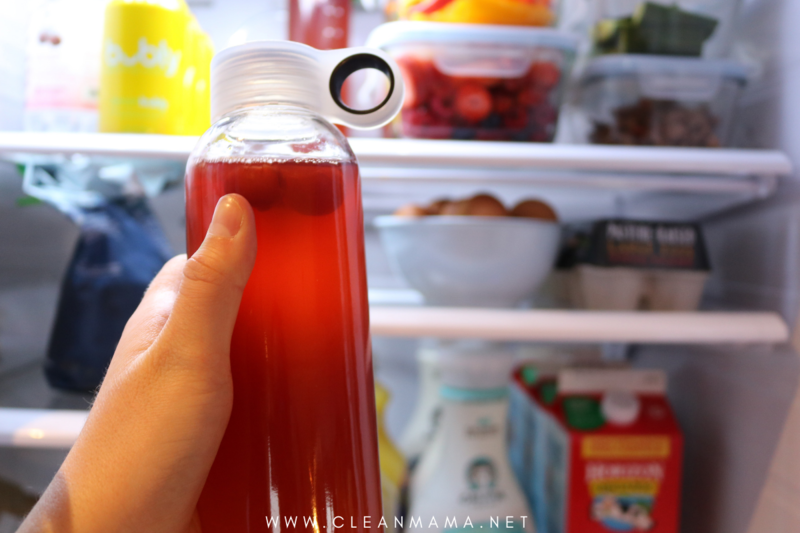 ICED TEA or KOMBUCHA or FLAVORED WATER – I make a batch of kombucha weekly – if you aren’t familiar with kombucha, it’s a fermented tea that is so good for your immune system – the kids drink it every day. I use the basic recipe from the Kitchn if you’re interested. In the summertime I make a jug of iced tea every other day or so. Want to up your water intake? Try filtering water into a glass jar or pitcher and add sliced lemons, pineapples, berries, herbs….drink the water in 1-2 days. BERRIES AND VEGGIES – We eat a lot of berries – they’re high in antioxidants and lower glycemic than other fruit. I wash and dry blueberries, strawberries, and raspberries and thoroughly dry them and put them in a glass storage container. 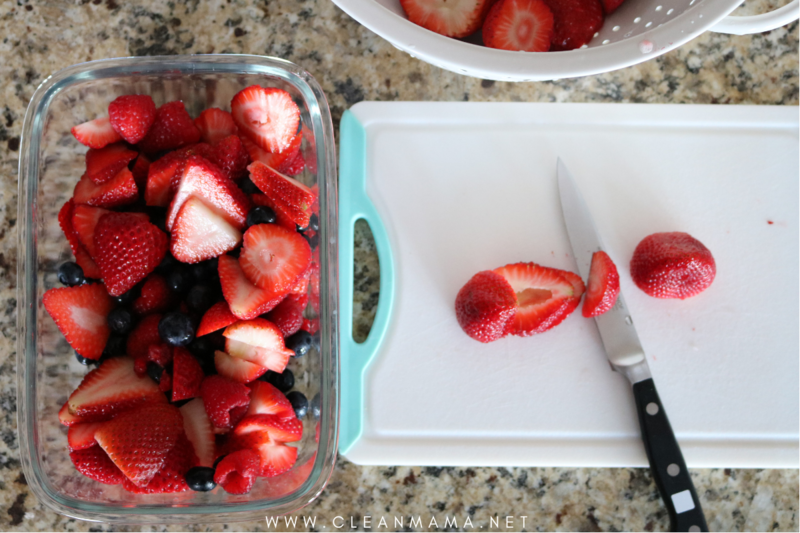 This will typically only last 1-2 days which is perfect because washed berries don’t last long in the refrigerator. I will do this 2-3x during the week. We eat them with dinner as a side or as dessert, add them to salads, on oatmeal or granola with yogurt for breakfast. For veggies I cut up cucumbers and peppers into strips and put them in a glass container. I put that container in the fridge and the kids will grab some for lunches, snacks, or I’ll cut them up for salads during the week. Not all veggies keep this way but I find that carrots, cucumbers, and peppers can go a couple days. 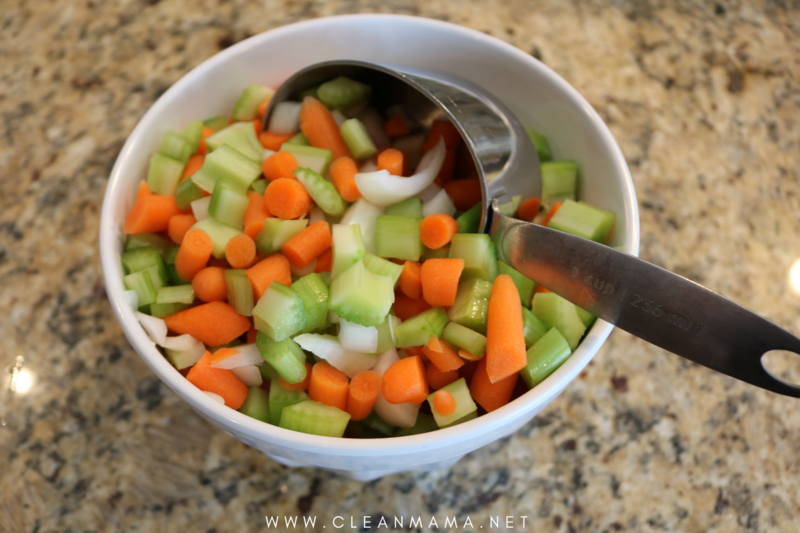 Another little hack is that if I’m doing some meal prepping for freezer meals, soups, or crockpot/instant pot meals, I’ll cut up a bunch of celery, onions, and carrots and put it in a bowl and scoop it out for the meals. Whatever is left goes in the freezer for a quick meal component. 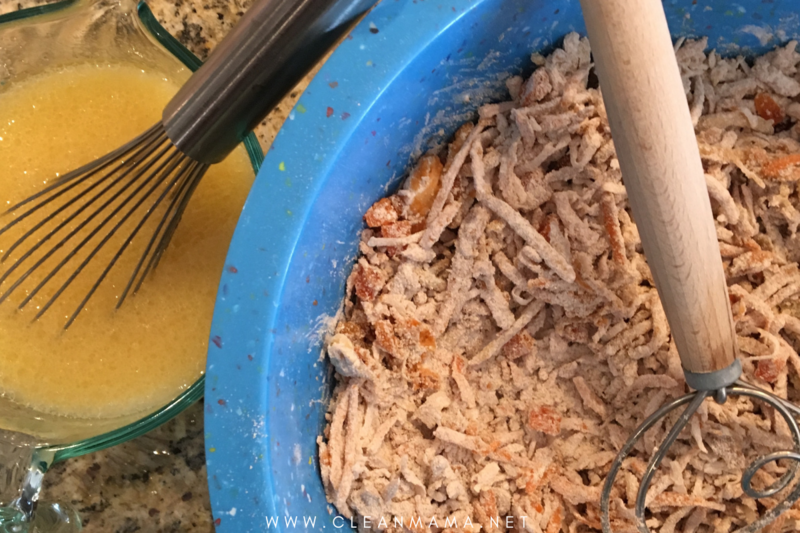 ROTISSERIE CHICKEN – One of our local grocery stores has excellent quality rotisserie chickens and it’s such a quick and easy meal prep item. Typically on Fridays when I do my grocery shopping, I grab three rotisserie chickens and cut the first one up for dinner on Friday night and then shred the rest for meal components. Sometimes I’ll just cut them up and put them chicken in the fridge for the weekend. 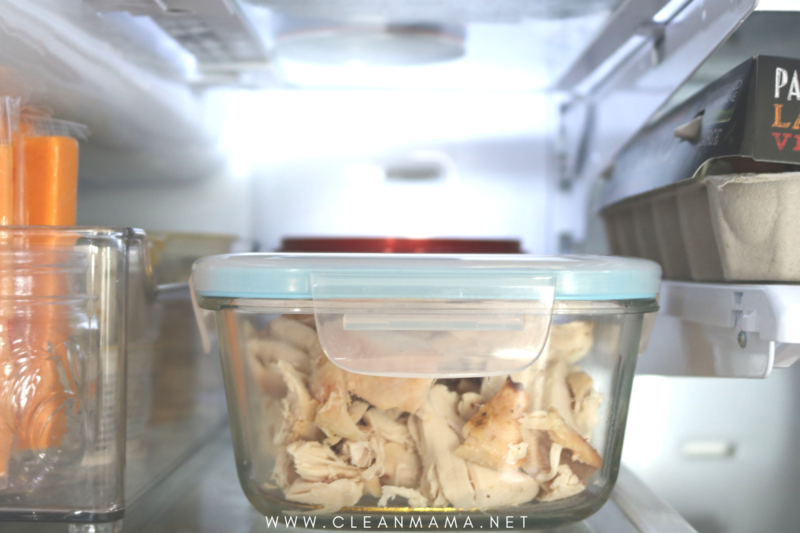 We’ll put the chicken in salads, make chicken salad, wraps, tacos and quesadillas….I’ll keep this on had for 3 days – if we haven’t used it all up in this time (rarely happens), I’ll just put the container in the freezer. PROTEIN BALLS /MUFFINS – I add something for snacking or lunches during the week – it might be muffins (like the pictured Morning Glory muffins), homemade granola, and protein balls. We use these in the kids’ lunches and as breakfast components. Having pre-made healthy options helps us to make better choices. 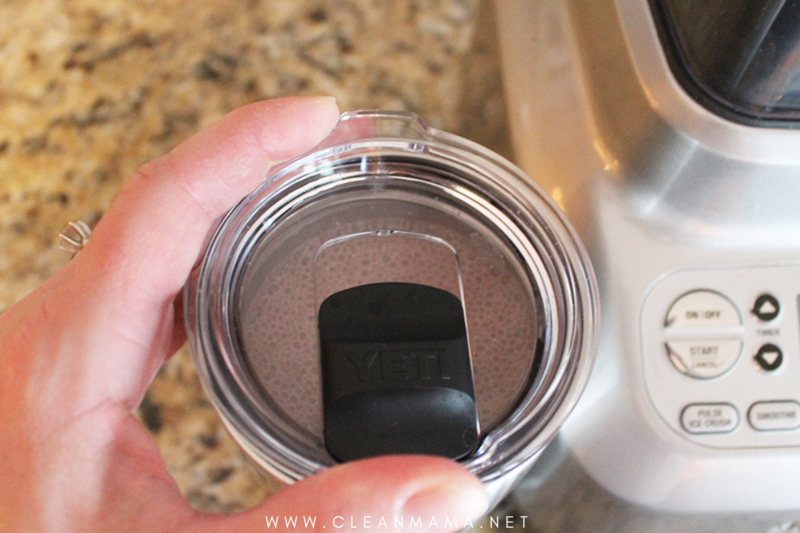 SMOOTHIES – My husband and I have smoothies every day as our first meal. I’ve shared how I organize this space in our pantry here. Making sure we have these ingredients ready is helpful for getting us out the door in the morning and starting the day off right. Have you tried meal prepping? I find that finding a handful of things that you are making daily or multiple times a week and batching those things is more efficient in our home. What can you prep this week to save yourself some time? 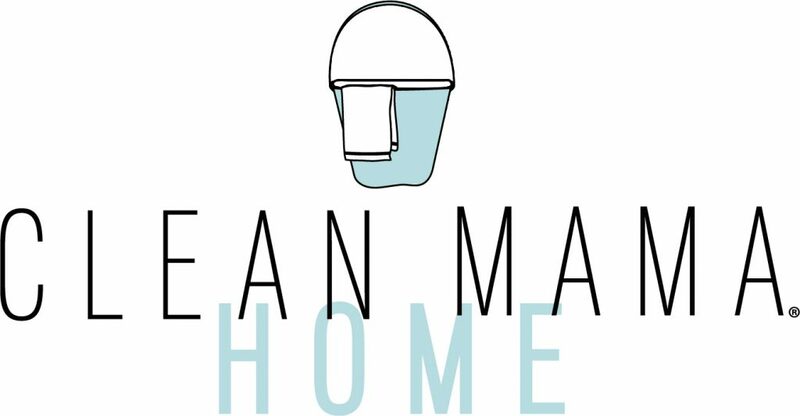 I talk about this extensively in my new book, Clean Mama’s Guide to a Healthy Home, but if you haven’t read it yet, I use glass storage containers and purchase what I can in paper or glass – why? 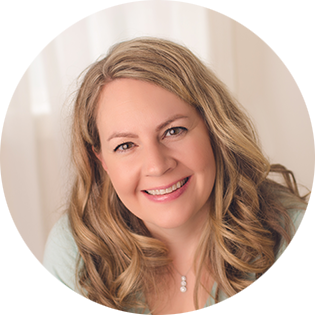 Limiting your plastic exposure is important – did you know that cumulative plastic exposure (especially for kids and pregnant women) can interfere with the body’s natural hormones? Sure, plastic doesn’t decompose quickly, but I’m more concerned about the effect it has on my kids when it seeps into their food. Be aware and do your best. Switching from milk in plastic jugs to milk in paper containers is a super simple swap to start with. How long can you keep the boiled eggs for? Great ideas, Becky! I love your permission to start with just one thing. Interesting to see what works for you. I do keep filtered flavored water in the fridge. Smoothies, juices, and all produce I prepare as I need them. They are fresher that way. However, when I cook a pot of beans or soup, I make double batches to freeze. I also prefer to meal plan rather than prep. We eat a lot of fresh produce in our house and I don’t like that precutting because it results in faster spoilage…and brown spots forming on more surface area. I do prep the pantry though – I’ll pre-make big jars full of our favorite yogurt topping mixes, make homemade bread crumbs, seasoning mixes, dry soup mixes, brad/muffin/pancake mixes, and granola blends. Having a pantry full of homemade versions of these types of things makes scratch cooking go so much faster, cheaper, and healthier. Thanks for the info. I live alone and I often find it difficult to cook for myself. So I try to prep veggies at one time and use them in my go to recipes. With ground beef, I make meat loaf that I put in muffin tins and also meat balls. Same recipe, same cutting of veggies onion celery, etc. I freeze them and easy to pop the meat balls in a tomato veggies sauce (1 can of diced tomatoes and 1 can spaghetti sauce with all the veggies you like). The meat balls can also be used for Swedish meatballs or with a sweet and sour sauce on rice.I put them frozen in the sauce. They heat up quickly.